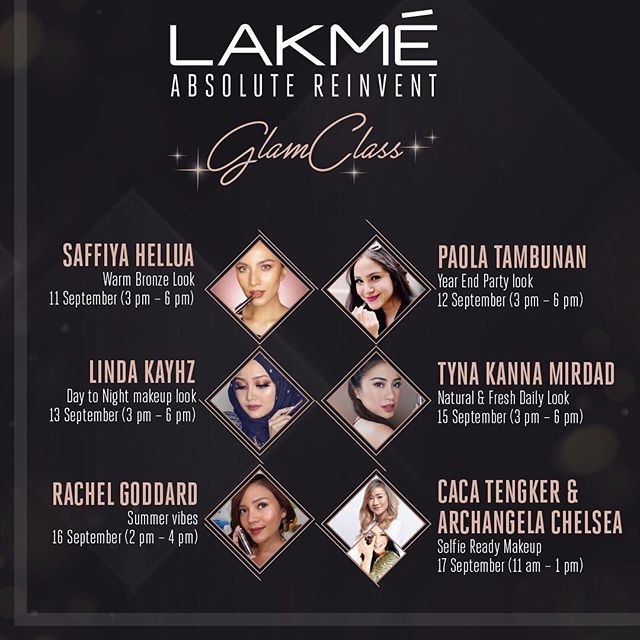 Archangela Chelsea will be having a Make Up class at Lakmé Absolut Reinvent Glam Class. This very first Glam studio from Lakmé make up held at Grand Indonesia East Mall Atrium, 11 – 17 september 2017. There wil be Make up class with some Beauty influencer such as Saffiya Hellua to get warm bronze look, Paola Tambunan to get year end party look, Linda Kayhz to get Day to night makeup look, Tyna Kanna Mirdad to get natural & fresh daily look, Rachel Goddard to get summer vibe look, and also Our Archangela Chelsea who will collaborate with Caca Tengker to achieve Selfie ready make up on september 17th. Go visit Lakmé make up on instargram @Lakmeprgirl for more information.